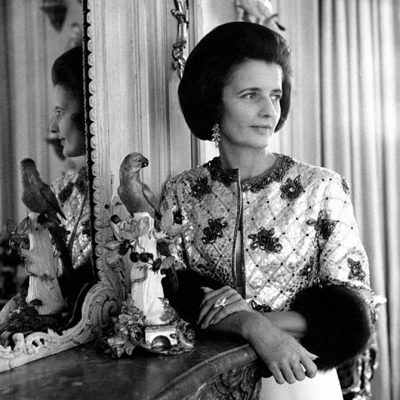 The ideal Object to me is an Object that is useful for absolutely nothing; that could be used for writing or removing superfluous hair or for telephoning; an Object which would not be placed on the mantelpiece or a Louis XIV commode; an Object which one is forced simply to wear—a jewel. 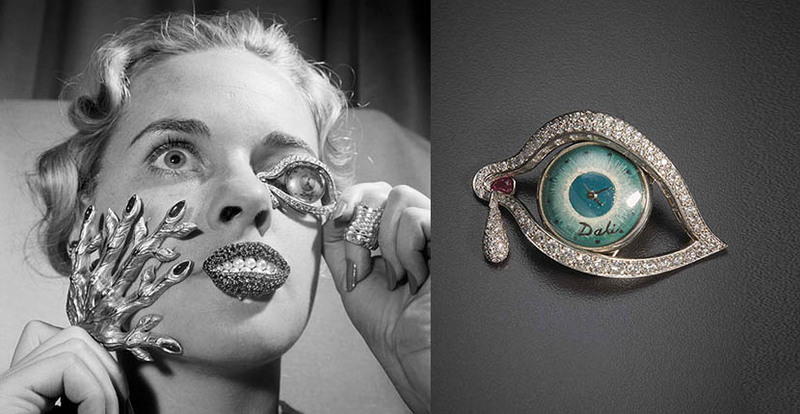 The collection of jewels by Dalí and Verdura was wildly successful. 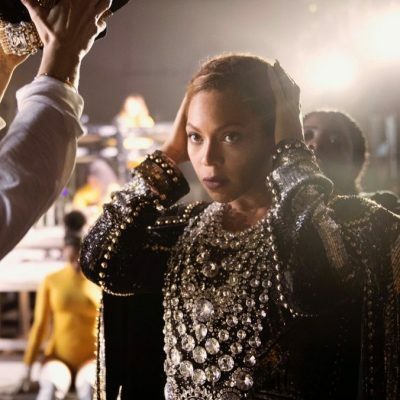 It debuted at the Julien Levy Gallery in New York with an exhibition of the artist’s paintings. They were also displayed at the Museum of Modern Art in conjunction with an exhibition on Dalí and Miró. 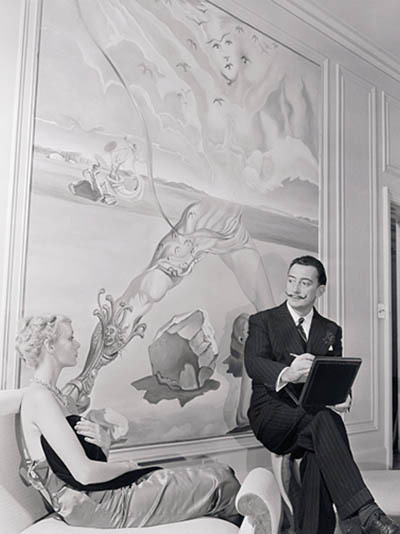 In 1949 Dalí signed a contract with the New York based Argentinian jewelry manufacturer Carlos Alemany to create his own collections. 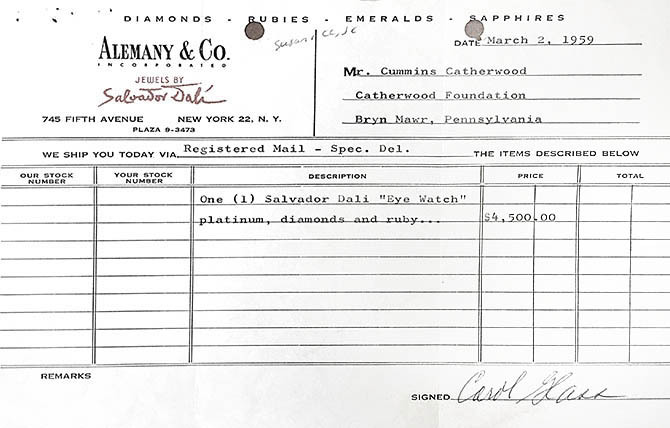 Before the jewels were even made, 22 pieces were sold from the designs to the Philadelphia banker and philanthropist Cummins Catherwood and his wife Ellengowan. 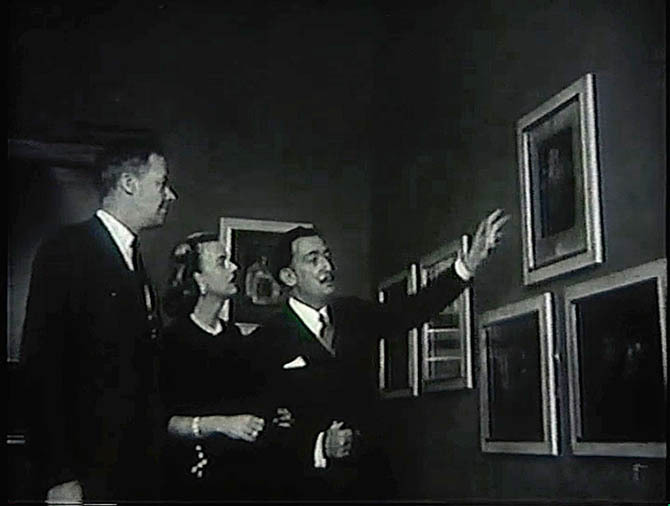 They were great believers in Dalí’s jewelry design talents and not only displayed the collection in the living room of their mansion in Haverford, Pennsylvania, they also supported the work in gallery exhibitions. 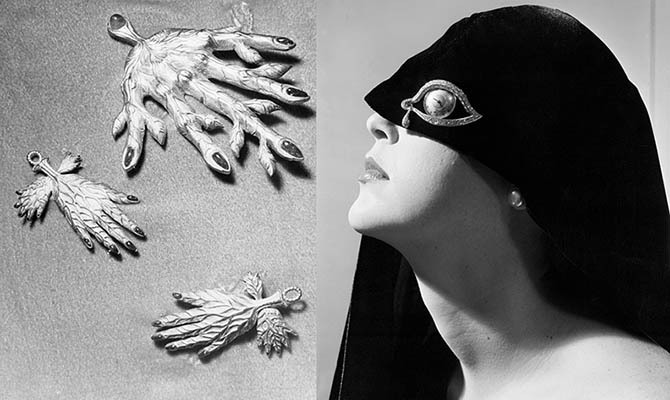 While the Catherwoods must have been delighted the Owen Cheatham Foundation’s presentation of their Dalí jewelry collection was critically acclaimed by esteemed critics from The London Times and Art News not to mention architect Philip Johnson, Ellengowan realized there was one jewel in the collection she couldn’t live without, The Eye of Time brooch. It was among Dalí’s most well-known designs and the cover piece on the catalogue Dali, A Study of his Art-in-Jewels. The pavé-set diamond and platinum eye brooch has baguette-cut diamonds set along the lid, a diamond tear drop pendant and a ruby at the lacrimal sac. The dial of the watch was hand painted and signed by Dalí. Movado was responsible for the mechanical movement. The piece Dalí agreed to recreate for his patron in 1958, in the photograph at top, is now being offered for auction at Sotheby’s in New York on May 17, 2017 with an estimate of $300,000 – $400,000. The 2¾-inch long jewel is one of only four know examples of The Eye of Time. One was sold to a private collector by Sotheby’s on May 8, 2014 for $1,055,000. One is in a European Royal collection. The Eye of Time in the The Owen Cheatham Foundation is on permanent display at the Fundació Gala-Salvador Dalí in Figueres, Spain.